With over 50 years of fine woodworking experience, Academy can help you choose a fence and gate using the finest of materials. Combining cedar, spruce, and pressure treated lumber, we manufacture wood fencing that will give you years of maintenance-free beauty. 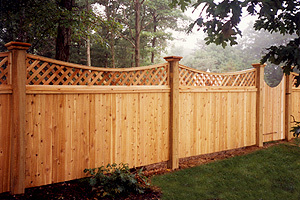 We have many, many choices of beautiful wood fence styles for both privacy security and safety – in all sizes. Not just the new kid on the block! PVC vinyl fencing will never deteriorate and are maintenance-free. While the initial cost of vinyl fencing is greater than wood fencing, it is one of the best values in fencing today, saving you both time and money. 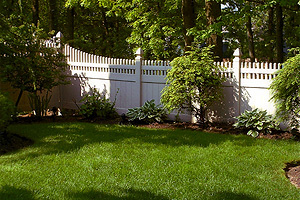 Vinyl fences are now available in many styles and colors. Your quality fence is built with the finest virgin vinyl and the finest stainless steel and vinyl hardware. Estate fencing is the ultimate fence to enhance your property. Imagine how stately your home could look! 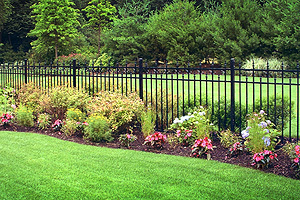 Accented with floral or shrub landscaping, aluminum fencing will sustain watering with no deterioration. We can also design and install beautiful aluminum entrance gates for your home or community. The styles of estate fences are limitless—we can advise you how to properly use style, size, and color. We can also provide you with iron historical reproductions. Time-tested chain link fencing can be the best choice in many applications. Lasting forever, it’s the fence you can forget about! 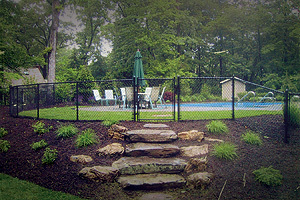 We use the finest grade materials and are experts in helping you integrate the fence to any setting—it always works well in a wooded area. Call Academy Fence to help you design and install any residential or commercial chain link fencing project.